Haram in the Harem focuses on the differences in nationalist discourse regarding women and the way female writers conceptualized the experience of women in three contexts: the middle-class Muslim reform movement, the Algerian Revolution, and the Partition of India. 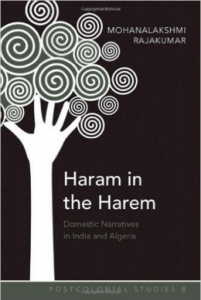 The writers of this study, Ismat Chughtai (1915-1991), Assia Djebar (1936-), and Khadija Mastur (1927-1982), the danger to women was not in the public sphere but embedded within a domestic hierarchy enforced by male privilege. In their fictional texts, each writer shows how women resist, subvert, and challenge the normative behaviors prescribed in masculine discourse. In their writings they highlight the different ways women negotiated private spaces between intersecting masculine hegemonies of power including colonialism and native patriarchy. They demonstrate distinct literary viewpoints of nation, home, and women’s experiences at particular historical moments. The choice of these various texts reveals how fiction provided a safe space for female writers to contest traditional systems of power. Bringing into focus the voices and experiences of women—who existed as limited cultural icons in the nationalistdiscourse—is a common theme throughout the selected stories. Available on Amazon.com and Barnes and Noble.com.